In fact, in one year, US forests are capable of filtering out 17.4 million tons of air pollution. Exposure to a richer, greener environment is good for our lungs, hearts, and even our minds, but the benefits may be especially pronounced for kids, whose lungs and immune systems are still developing. Redwood Regional Park is hidden right near downtown Oakland. Here, you’ll find rare and impressive stands of natural-growth redwoods. Regional Parks Botanic Garden, in Tilden Park near Berkeley, is preserved as a place for plants native to California. The enormous Tilden Regional Park also features an Environmental Education Center, Little Farm, carousel, and steam train for kids. Armstrong Redwoods offers an experience much like that at Muir Woods—but with fewer visitors, it is much more accessible. It’s located in Sonoma County near the Russian River. Once home to Ewoks and camera crews, Roy’s Redwoods is a peaceful preserve with some of the tallest trees in the Marin area. Marin’s Samuel P. Taylor State Park offers a combination of hiking and biking opportunities through the redwoods. There is a flat, paved trail along Lagunitas Creek that is perfect for kids with different levels of biking experience. Portola Redwoods State Park, in San Mateo County, is less frequented than some of the nearby parks, so expect peaceful trails among winding creeks. Big Basin Redwoods, California’s oldest state park, has three waterfalls to visit amidst the ancient coast redwoods. Located in the Santa Cruz Mountains, it’s also where we take campers for our three-day backpacking trips. Henry Cowell Redwoods, bordered by the San Lorenzo River, is also in the Santa Cruz Mountains. Here, you can hike through old-growth redwood groves. Emma Prusch Farm Park is in a rural part of San Jose. Here, kids can visit the animals, gardens, fruit orchard, and an elaborate playground. Walking through the Botanical Garden in Golden Gate Park is like touring the forests and gardens of the world, from the Mediterranean to South Africa to Australia to the Southeast Asian cloud forest. UrbanForestMap.org helps you determine how green your neighborhood is, and can help you locate greener spaces nearby for your family to spend some time in. Friends of the Urban Forest is an organization that actively promotes, plants, and preserves urban forests throughout San Francisco. You can contact them to get involved or to find out how to get more trees planted near your home or near your children’s schools. Your family’s renewed connection to the green spaces around you is also a great way to start a conversation with your kids about how important it is to protect and expand our forests. They’ll already be familiar with this endeavor from our conversations at camp under the towering redwoods, but they can still get involved at home. One way is through Friends of the Urban Forest, but you can also commit to planting and caring for trees right around your home and get your kids excited about it, too. You can even get your kids involved in caring for indoor plants that help to green and purify your home environment. 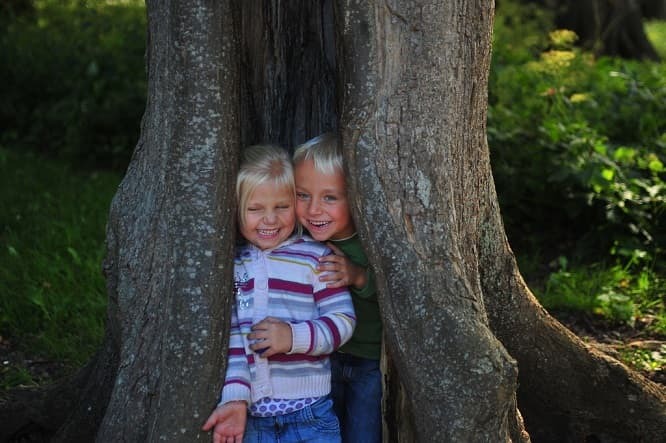 Take advantage of the local parks near you, and encourage your kids to run around, climb the trees, and breathe deeply. Our kids will be the future protectors of the Bay Area’s green spaces, so let’s help them understand how important the trees are for our health and happiness—and that of future generations. At Kennolyn, kids learn about the redwood trees and all of their miracles. They learn about our interdependent relationships with the ecosystems around us, and they enjoy the fresh mountain air. Get in touch to learn more about our programs and our special location.